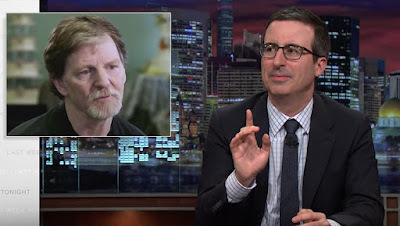 John Oliver ridiculed Phillips's selective morality at the 10:00 mark here. Jack Phillips, who ran afoul of the Colorado Civil Rights Commission for refusing to bake a gay couple's wedding cake, appealed to the state's Supreme Court, which refused to hear his appeal. Appeals judges did not agree that the Colorado Anti-Discrimination Act forced Phillips to endorse any religious views by baking a wedding cake for an LGBT couple, finding instead that it only prohibits Phillips from discriminating against customers based on their sexual orientation. Phillips is now claiming, in neighboring Nebraska (opposing Sen. Adam Morfeld's LGBT employment antibias bill, LB173), that "The government's actions have forced me to lose 40 percent of my business," — presumably ignoring revulsion and subsequent avoidance by prospective and current customers on account of his attitude. Phillips added, during a Unicameral hearing in Lincoln this week, that the Colorado law he flouted, which bans discrimination in a public place on grounds of sexual orientation, is "similar"to LB173, which would prohibit discrimination in hiring solely on sexual orientation or gender identity in Nebraska. Below is Morfeld's introduction of LB586, his 2016 attempt to outlaw anti-LGBT employment discrimination in Nebraska.